Ladies and gentlemen and fellow ugly bustards. 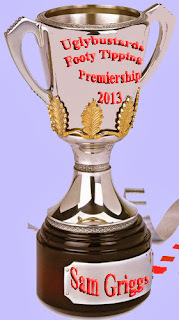 It gives me great pleasure to present this year's winner of the fourteenth Ugly Bustards Footy Tipping Premiership in 2013 with the Ugly Bustards Premiership Cup, the holy grail of footy tipping. Well done Mr. Sam Griggs. Sam is the 11th winner of the prized cup in fourteen years of Ugly Bustards Footy Tipping. The only punters to have won the treasured prize twice are inaugural winner Arnold Layne and denlash. Previous cup winners' engravings can be viewed on Facebook. Sam had an exceptional season winning by a record margin of six tips, and finished higher than any other Ugly Bustards tipster in history on the overall footytips.com.au site, with a 27th placing out of nearly half a million tipsters. This eclipsed teenyweenybustard's placing of 121st in 2001. Runners-up this year were Powerful, Craig Nettlebeck and Amy Jones, view the Hall of Fame for the archive of Ugly Bustards Footy Tipping winners. See you at pre-season training, and don't forget you can't get by a hot summer without an Ugly Bustards stubby holder to keep your drink nice and cool. Thanks all for your participation this year, and Go Youse Ugly Bustaaaaaaaaaaaaaaards!!! The Uglybustards "Show us Your Footy Finals Form" photo competition finished on 4th October 2013 when the final votes were tallied by the panel of judges. The winners were Deb Smith and Trent Mayne. Well done guys and thanks for entering. Deb's snap was taken at the Sydney Swans Vs Carlton semi-final at ANZ Stadium just prior to the first bounce. 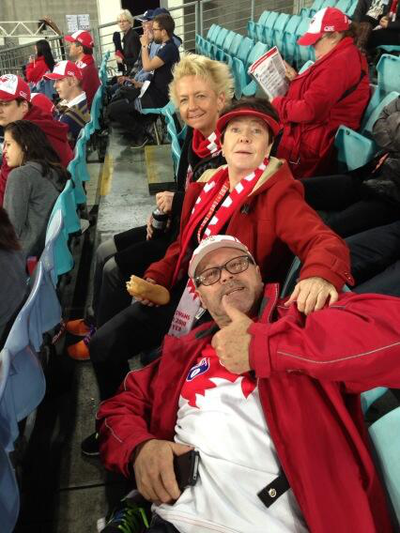 It captures Uglybustards tipster The Boot, among other Swans members faithful including MJ. 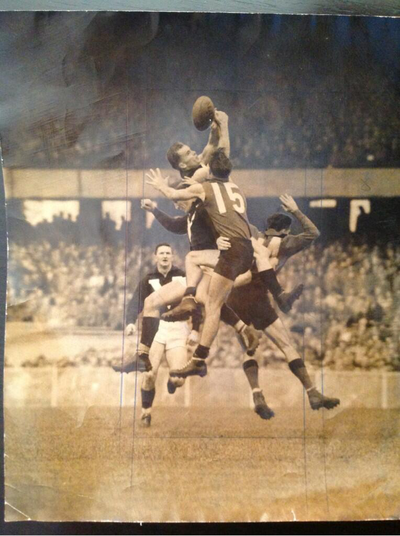 Trent's photo is 1961 Brownlow medalist and Carlton great John James playing for Victoria against South Australia. Although Trent didn't take the pic himself he owns the copyright. 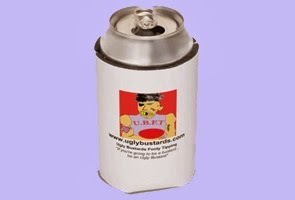 Each have won an Uglybustards T-shirt and a limited edition Uglybustards stubby-holder, now retailing at $10 including delivery.